The book of Alma describes the profound faith of Abish, “one of the Lamanitish women” working as a servant in the king’s house, who had been converted to the gospel “on account of a remarkable vision of her father” (Alma 19:16). Abish played a pivotal role in the account of King Lamoni’s conversion, as it was she who “ran forth from house to house, making it known unto the people” of Lamoni’s miraculous experience (v. 17). As a result of Ammon’s teaching, Lamoni had realized his sins, begged for God’s mercy, and had fallen to the earth “as if he were dead” (Alma 18:42). The queen, convinced that Lamoni was not dead, called for Ammon to raise him back up. After the third day, Ammon having raised Lamoni, the king stood up and blessed the queen, saying “Blessed art thou, for as sure as thou livest, behold I have seen my Redeemer; and he shall come forth, and be born of a woman” (vv. 12–13). At this, the king sunk down again in joy, the queen also collapsed “overpowered by the spirit,” and Ammon was also so overpowered by joy that he also sunk to the earth (Alma 19:13–14). Seeing this, all the servants of the king cried unto God and likewise fell in fear of the great power of Ammon. Except for one woman: Abish. The people began to offer their speculations about what had happened. Some saw this as a great evil; others saw it as a fitting punishment for the sternness of Lamoni. A relative of one of the men Ammon killed moved forward to kill Ammon, who had also fallen unconscious, only to fall dead himself. In terror, the people argued with each other, not knowing what to make of this situation. At this point, Abish was reduced to tears, and she stepped forward and took the queen by the hand (Alma 19:29). She immediately arose, stood up, and cried “O blessed Jesus, who has saved me from an awful hell! O blessed God, have mercy on this people!” She then took the king’s hand, and he arose and, seeing the contention, rebuked his people and began teaching the words that Ammon had taught him (vv. 29–31). Those who would not believe left, and soon Ammon arose, as did the servants, all declaring that they had seen angels and that their hearts had been changed, thus commencing the work of the Lord among the Lamanites (Alma 19:33–36). None of this would have happened without Abish taking the initiative in gathering the crowd. Abish was remarkable for many reasons. First, she is one of the few named women in the Book of Mormon. 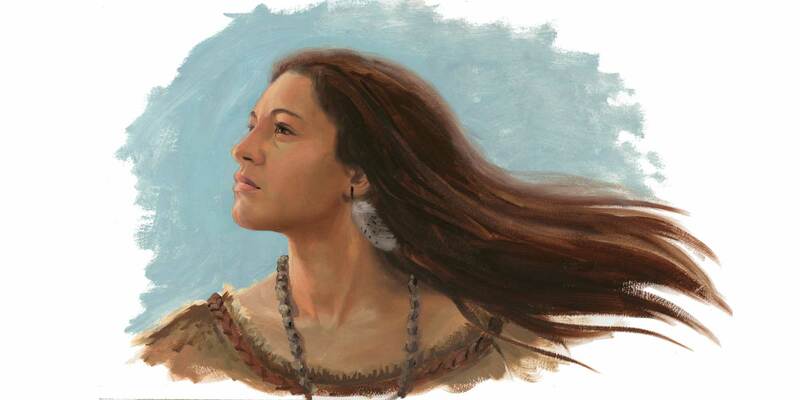 In each story, the named women of the Book of Mormon played an integral role. Second, that Mormon retained this story, specifically mentioning Abish by name, likely signifies that the prophet-historian wanted readers to pay attention to several special or unique things about her. The name Abish most likely derives from the Hebrew elements ab (“father”) and ish (“man”), and straightforwardly means “father (is a) man.” But more than just that, there appears to be a deliberate pun on her name in this passage that highlights an important doctrinal teaching. Right after Mormon wrote the name Abish (“father is a man”), he immediately follows with the detail that she had “been converted unto the Lord for many years, on account of a remarkable vision of her father” (Alma 19:16, emphasis added). This could be understood as saying that Abish was converted by a vision that her earthly father had previously had, or that she had seen a vision of her earthly father perhaps after his death. Alternatively, and possibly most likely, it may signal that she herself had a vision of her Heavenly Father, or of Jesus Christ, the “Eternal Father” of heaven and earth, as He is called by Abinadi (Mosiah 15:1–4). The story of Abish was recorded for many reasons. Ammon’s converts must have enjoyed retelling this foundational story for years to come; how a servant girl had faithfully and spontaneously served her king and queen. Only Abish understood what was truly happening, when others were puzzled and conflicted. Because this woman was not deterred by her fears, many people heard the queen’s testimony firsthand, as she bore witness that the Redeemer of the world would be born of a woman. Abish was specifically mentioned as having played a crucial role as a spiritual midwife at the turning point of this commencement of this first Nephite missionary success among the Lamanites. The mention of the name Abish and the wordplay on her name in Alma 19:16 reinforces . . . the importance of the doctrinal truth that the Jesus Christ, the Eternal Father of heaven and earth would not simply remain a spirit forever (contra Zoramite belief, Alma 31:15), but would become “man,” so that we might become “divine” not only like our Savior (the Eternal Father of heaven and earth), but also like our Heavenly Father who once was “man,” as was revealed to and by the prophet Joseph Smith. All of this should make us grateful for righteous fathers and mothers who pass on correct traditions to us, and more anxious to discard ancestral traditions that could inhibit or stop our eternal progress (see especially D&C 93:19, 39). Alternatively, if “the vision of her father” is understood as meaning Abish had a vision of her Heavenly Father, then her name (“father is a man”) could be viewed as reinforcing the truth revealed in Restoration scripture that God the Father is an exalted man of flesh and bone (cf. Doctrine and Covenants 130:22–23; Moses 6:57). This play on words adds doctrinal depth to the Book of Mormon and also strengthens the Nephite record’s ties with the world of ancient Israel. It also pays grateful respect and tribute to Abish, the servant woman, whose spiritual father would come to earth as a man. “Abish,” Book of Mormon Onomasticon, ed. Paul Y. Hoskisson, online at https://onoma.lib.byu.edu. Donna Lee Bowen and Camille S. Williams, “Women in the Book of Mormon,” in The Encyclopedia of Mormonism, ed. Daniel H. Ludlow (New York, NY: Macmillan, 1992) 4:1577–1580. Donna Lee Bowen and Camille S. Williams, “Women in the Book of Mormon,” in The Encyclopedia of Mormonism, 4 vols., ed. Daniel H. Ludlow (New York, NY: Macmillan, 1992) 4:1577–1580. For more on how Jesus is the Eternal Father, see Book of Mormon Central, “How is Christ Both the Father and the Son? (Mosiah 15:2),” KnoWhy 92 (May 4, 2016). The Hebrew Bible is rife with puns and plays on words, including puns on names. For examples, see Samuel Thomas, “Adam/Adamah,” Bible Odyssey, online at https://www.bibleodyssey.org; Barry J. Beitzel, “Exodus 3:14 and the Divine Name: A Case of Biblical Paronomasia,” Trinity Journal 1 (1980): 5–20; Herbert Marks, “Biblical Naming and Poetic Etymology,” Journal of Biblical Literature 114, no. 1 (1995): 21–42; Gary A. Rendsburg, “Word Play in Biblical Hebrew: An Eclectic Collection,” in Puns and Pundits: Word Play in the Hebrew Bible and Ancient Near Eastern Literature, ed. Scott B. Noegel (Bethesda, MD: CDL Press, 2000), 137–162; Scott B. Noegel, “Paronomasia,” in Encyclopedia of Hebrew Language and Linguistics, ed. Geoffrey Khan (Leiden: Brill, 2013), 3:24–29. Bowen, “Father Is a Man,” 92. Bowen, “Father Is a Man,” 92–93. Discourse, 7 April 1844, as Reported by Wilford Woodruff, online at https://www.josephsmithpapers.org/, spelling and grammar standardized.